You skipped breakfast in the rush to make it to your 9 a.m. class on time. Throughout the day, hunger kicks in and by noon you are in the food court, skimming over the Chick-Fil-A chicken sandwiches, hot dogs, Philly cheese steaks and fries you can gorge during your 15 minute break between classes. You don’t have time to wait in line for the Philly cheese steak, so you grab that Chick-Fil-A spicy chicken sandwich, waffle fries and a small strawberry shake. With that, you’ve already consumed a quarter of the daily 2,000-calorie diet the FDA recommends you need to stay healthy, before dinner. The notorious “Freshman 15” is no longer a lighthearted tradition of gaining a couple pounds during freshman year; college obesity has been a serious problem in America. 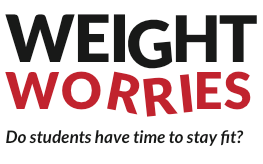 With over 5.2 million college students overweight, a 2011 report from the Centers for Disease Control and Prevention shows students face challenges balancing life, school and their weight. The continuous on-the-go lifestyle of late night cramming and stuffing faces in between classes are important factors in the weight of students. Since grade school, the health risks of obesity, such as diabetes and increased risk of heart disease have been drilled into the minds of students. Yet mental and self-image effects are less considered but can be just as damaging. In middle school, Carter Bates, a sophomore, experienced the emotional toll of being obese at 260 pounds. Bates suffered a mild eating disorder after growing tired of the constant teasing and insults by his peers. Bates, now 160 pounds, found a better way to maintain a healthy weight by drinking water, limiting sugar consumption and eating equal amounts of fruit and vegetables. Although the direct causes of obesity are still undecided, medical doctors do point to several societal and environmental factors, such as diet, nutrition, exercise and more recently family history and genetics, contributing to this boom in unhealthy weight. Personal trainers and nutritionists attribute exercise, portion size and control as vital ways to maintain a healthy weight and keep metabolism in check. All meals break down into sugar and the pancreas cannot handle large meals, said Ramer. For this reason, he said it is important to eat many small meals, around every two or three hours, to get adequate sleep and have 30 to 60 minutes of moderate to vigorous exercise two to three times a week. Emma McPhail, graduate assistant of Fitness Operations at the Student Recreation Center said students should eat in small portions and incorporate more vegetables, fruits and less processed foods in their diets. For her personal health, McPhail said she uses the down time during her daily activities to squeeze in a quick workout. “It’s all about making time,” McPhail said. “If I’m in my bedroom, I’ll do 2 minutes of squats, 2 minutes of push-ups, then the Bird-Dog yoga pose, lunges, ab exercises and some pull-ups with a pull up bar on the door. She suggests this workout to students as well. Though several students attribute stress as the cause of bad eating habits, the choices students make in between classes are critical to the problem as well. However, avoiding processed and fast foods may be a lot easier said than done for many college students. Dining halls and food courts waft the smell of burgers, fries, fried chicken and nachos, which are often stocked with unhealthy choices. Healthy options, such as salads, deli sandwiches and fruit are available in the food courts on campus, but many students choose the unhealthy foods for convenience, price and time. Knowledge of nutritional facts for on-campus dining is also an obstacle students face because most of the food courts do not have complete nutritional facts readily available for students. When The Signal requested nutritional facts and information from the vendors in the different food courts on campus, the vendors were unable to provide the information. The franchise vendors, such as Freshens, Chick-Fil-A, Simply To Go and Einstein Bros were the only vendors who had this information available either onsite or on the franchise’s website. For first-year Neurobiology and Behavior student Eleen Zarebidaki, it is difficult to balance both teaching and taking classes with a proper diet and exercise. But she made it a priority. She began playing soccer at the Recreation Center this semester as a way to wind down and stay in shape. “I try to work out twice a week, but sometimes I only can once. At least once a week I play in a GSU soccer club at the OMNI gym in the Rec. center,” she said. “If you want to do something you find the time for it. I book every Friday in advance so I have time to play soccer,” said Zarebidaki. Many students are taking advantage of the Recreation Center’s gym and the free classes provided there. “Three to four times a week of working out is my usual routine. I run the track [here] or attend Zumba classes,” said Erica Bell, a sophomore Biology major. Bell began working out in the center two months ago and said she felt less “stressed out” after exercising. Bell also plays soccer, volleyball and participates in karate. “Making small changes can be applicable to everyone. It can be daunting to try and start a new exercise regime or diet. It takes a lot to change your lifestyle, so you have to start small, with little pieces you can handle,” McPhail said. After choosing to make healthier decisions in his life, Bates said he is proud of his weight loss. “These days I look back on what I used to look like, especially who I used to be, and who I am now and I am really proud of myself. As far as the change [I made], I have no regrets at all,” Bates said.